Jane Couroussopoulos studied painting, etching and engraving at City and Guilds of London Art School. She moved to Edinburgh 30 years ago where she has a studio in Coburg House, Leith. She works as a painting tutor and drawing course leader for Leith School of Art and as a community education tutor for Edinburgh City Council. She travels widely as often as possible, particularly to Greece where her family are originally from, and it is from these journeys, both abroad and in Scotland, that she finds her subjects. 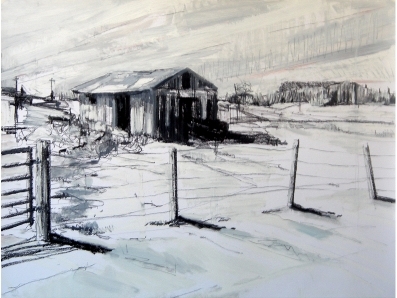 Objects and places that have a particular significance, are the subjects of Jane's work, but contrasts are the theme. Compositionally, the contrasts lie in the juxtaposition of busy and empty areas, and flat and textured surfaces. In terms of the narrative, they are found in the tension between the objects and the abstraction of the space around them, organic and man-made structures, and in the representation of urban and rural spaces emptied of people.